Q: Why did you start home hemodialysis? Robert: We were going to the in-center for Satellite Healthcare in San Mateo for a while. I didn’t particularly like running back and forth 3 times a week. And when Floyd (the nurse) opened up the opportunity for us to learn about home dialysis, I thought, well this sounds great to me. So we took the course at Satellite WellBound of San Mateo, Martha and I and our oldest daughter. Both are registered nurses. Robert: In our case it wasn’t a scary proposition anyway. If you learn to do something, you take the course and you pay attention when you’re taking the course, then it becomes far less of a traumatic situation. When I took the training with Martha and our daughter, they were learning a lot, but anything they did, I also absorbed. Martha: Plus, you have the support here and over the phone that gives you information with anything that’s going on, which is a blessing. Just don’t be afraid of the whole thing because you’ve got good back up. You’ve got good back up with both WellBound and NxStage. I think if you’ve got the good back up, then it changes the whole situation. Robert: I didn’t find anything scary about it. I’ve been shot at, and missed thankfully. So why would I be afraid of getting stuck with a needle and developing a button hole? It didn’t feel comfortable for a long time and there are times even now that it’s not exactly comfortable when the needles are going in. But once they’re in the channel, it’s like wearing my glasses, even though they are putting holes in the side of my nose and alongside my head. At 93 years old some of the parts are wearing out. I do what I can do to keep the joints oiled, and I live with it. So I’ve got some pain here and there. I’ve got an arthritic thumb that sometimes doesn’t work. It’s all part of the game. Robert: It’s far better than going to the in center. Doing home dialysis, as long as the numbers are good, I can sort of juggle my days off and that sort, too. I can also set a schedule so that I have my Wednesdays off and my Sundays off. Martha: Wednesdays is our day to work out with the trainer. We’ve been doing that for at least 15 years, a physical workout. And that’s why we’re strong at 91 and 93. Its weight training for all parts of the body, back, abdomen, arms, legs. Robert: After we go to see the trainer it’s also our day for Costco. Q: Would you add learning home hemodialysis at Satellite WellBound to your list of many adventures? Robert: Oh yes, it’s just another adventure. We’ve done a lot. We built our house and we built our boat. And now we’re building our bodies, to make them strong. Martha: We did build a 48-foot cement boat by ourselves. So building is something that we like doing. We sailed the boat to Tahiti and back. We left the harbor here in Redwood City in May 1985 and came back in September of 1990. Robert: Then not very long after that we went to China and taught English. After we came back, I got a call because they were frantic for a couple of people to go to Russia to teach English, so we did. And then next thing we know, they gave us another call to go to China again. Q: Are you able to still travel like you used to? Robert: I think that’s the only thing about being on dialysis in general that bothers me is that we can’t do the traveling that we used to do. Locally we definitely can travel. In fact, I was one of the fortunate people to get the honor to take one of the honor flights to Washington DC to see the monuments and memorials. I got approval from the doctor and they had a nurse with our group. Then we came back, I started my dialysis routine again. Martha: That’s one thing with in-center, not feeling well afterwards. That has been very very different. Like now, we just finished his home treatment and he drove here. No problem. But that’s a big difference between what they do at the center and the toll it takes on the body. Martha: I was just delighted because having him at home was so important to me rather than having to bring him to the center. 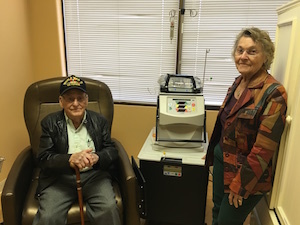 I didn’t know there would be such a difference in how he would feel after home dialysis. Just having him home and seeing things on the television and being together, you know. It made a big difference.